IT WAS on Friday when the damaged culvert on the Leeds & Liverpool Canal was at last repaired, but there is still no way to or from Liverpool docks. Today, Tuesday, Bells Lane Swing Bridge (16) at Maghull failed, once again cutting off navigation into Liverpool, though contractors have inspected the bridge, Keith Gudgin tells us. It was on the 13th June that the culvert under the canal at Holmes Swing Bridge near Melling collapsed, draining the 25 miles long pound, stopping all navigation to Liverpool, and the boats in the city then marooned. But the culvert was finally repaired on Friday, but those who did not make a quick get-away are still stuck by the failed bridge. 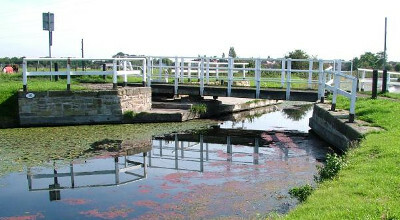 There have been many failures of the mechanical swing bridges on the Leeds & Liverpool Canal, with many believing they should be replaced with more reliable structures.